It was great working with you and your team on Savvy Hip Hops again this year! We are non-stop! Celebrating excellence in Canadian cheesemaking that is. This month we are shining the spotlight on Fromagerie du Presbytère cheeses and its cheesemaker Jean Morin, most celebrated of all in Quebec. Zealously dedicated to his craft, the Canadian artisan cheese industry and his community, Jean’s “joie de vivre” attitude towards cheesemaking and life knows no limits. It’s apparent at every turn – through his vision for and preservation of the tiny community of Sainte-Elizabeth-de-Warwick where he is deeply rooted, his support of Canadian cheesemakers and growing the industry and in his ever-expanding list of complex and flavorful award-winning cheeses. Crisp autumn leaves crunch underfoot as cheesemaker Jean Morin greets me on the Fromagerie lawn with his characteristic Cheshire cat grin “Allo Vanessa”. Along with this welcoming smile, he greets me with a warm baguette right from the oven under his arm, a block of his freshly churned heavenly butter and glass of local red wine. 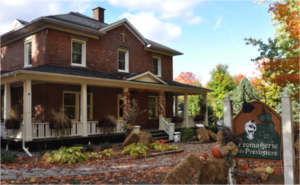 4th generation family run Fromagerie du Presbytère, in Québec’s central region, is named for the small, restored 1930’s rectory that houses the cheese factory in the tiny village of Sainte-Elizabeth-de-Warwick, including a new expansion, which converted the historic church next door into ripening rooms while preserving it’s integrity and purpose. 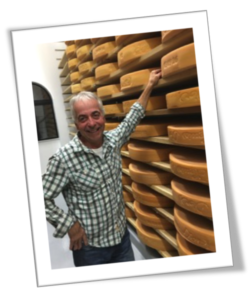 Jean Morin (in photo below) is always excited to talk cheese with an incredible level of passion for his craft that translates directly to his products. “The secret to exceptional cheesemaking is happy, healthy, animals” he says. The over 700,000 or so liters of raw, organic Jersey and Holstein cow milk used annually in cheesemaking comes from the 475-acre neighboring homestead and family run, Louis D’Or Farm, located directly across and down the street. The conversion of the old rectory years ago and now church has brought life into the region as both a social and economic hub and landmark. Jean’s famous Fromage Fridays happen from early May to mid October where the town comes alive, joining together in the spirit of community with up to 5,000 people convening on the front lawn at times to eat, drink and be merry in celebration for fundraisers, or simply to connect with their neighbors. Always the life of any party, Jean makes his rounds with a wedge of Louis D’or in hand, shaving off snacks as he mixes and mingles welcoming guests. The rectory is the heart of the Fromagerie, which employs a staff of 15, providing offices, retail space, the make rooms for cheese production as well as aging facilities for soft (Champayeur, Laliberté and Brie Paysan) and blue cheeses (Blue D’Élizabeth). In December 2015 local dignitaries cut the ribbon for the opening of Jean’s new aging room, housed in the cathedral next door. The $1 million investment gives the church a second life, converting it to aging rooms for washed rind cheeses, Louis D’or (it can hold up to 3000 40 kg wheels of Louis D’or) and Le Religieuse, a Raclette-style cheese, a second story event space for 150 people Jean had a small chapel re-installed, visible over the balcony from above as a community gesture to use for special occasions. 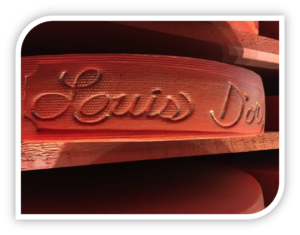 Upon entering the church, guests can see the golden wheels of Louis D’or in the aging room through charming cathedral windows and watch “Pat” at work. Pat is a new addition to the fromagerie. It’s European-built robot, unique in North America that does the work of flipping and brushing the giant wheels of cheese, allowing for more consistent product and Jean to spend more time focusing on developing new cheeses. Special lighting is installed in the aging room floor to allow Jean to “see” ripening in action as the mold develops on the cheese. 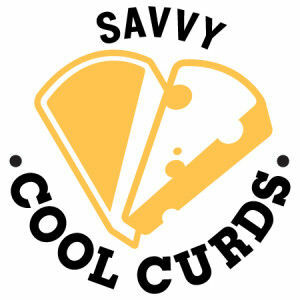 Visit the Savvy Cool Curds Facebook page to see my photos of this outstanding operation. 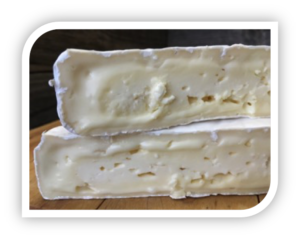 Below are Vanessa’s tasting notes and photos for each cheese in your Savvy Cool Curds, along with additional tidbits of interesting information, suggested food pairings & recipes to try too! Brie Paysan is one of the most unique brie-style cheeses in Canada while little known. Small format wheels pack a surprise flavor punch, especially when fully ripe. Look for the interior to be runny/oozey for the best experience (shown in picture is a young Brie Paysan). Tasting Notes: Rustic best describes this soft, surface-ripened pasteurized, organic, cow milk brie-style cheese. The thin, slightly dry, uneven, white bloomy rind encases a creamy, dense ivory, cheesecake-like paste when young, turning lusciously silky soft with a few weeks of extra aging. Big “barny” and fungal aromas give way to long lingering milky, buttery, and distinctly vegetal flavors (can you detect mushroom? cabbage?). Suggested Pairing: Brie Paysan has amazing melting abilities, add a slice or two to grilled cheese, top quiche or soufflés, pair with rustic local cured sausage (Seed to Sausage Saucisson Sec comes to mind). A wedge or two is all you need to compliment a local Chardonnay or Pinot Noir. Named after a local Ste. Elizabeth de Warwick sculptor, Laliberté has won numerous awards as a category winner of Selection Caseus. In 2015, this spectacular cheese beat out 268 entries to be named the Grand Champion of the Canadian Cheese Grand Prix. Tasting Notes Pure luxury best describes this soft, surface-ripened triple cream cow milk cheese. 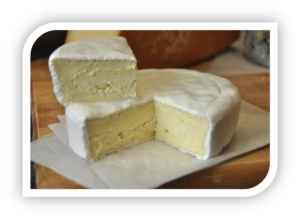 A delicate, tender, white, velvety, dewy rind encases a creamy yet silky, dense, cheesecake-like ivory paste. Fungal aromas lead to sweet, milky, buttery, mushroomy and sweet cream flavors with an underlying hint of salt that dissolve in your mouth leaving you licking your fingers and going back for more. Suggested Pairing: One of my favourite pairings with Laliberté a tart jam such as sour cherry or local dessert guru Michael Dolce’s Spicy Cranberry jam. Local sparkling wine or Rosé bubbles are a lovely companion to enjoy this exquisite triple cream cheese with. Louis D’Or, a French-style alpine cheese has been making headlines as one of Canada’s most famous Quebec cheeses since 2010 taking home top honors over many years at The Canadian Cheese Grand Prix, The American Cheese Society Competition, The Canadian Cheese Awards, The Royal Winter Fair, and Selection Caseus. 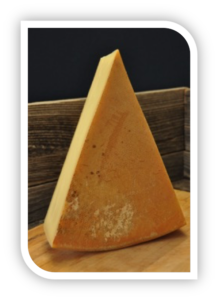 Tasting Notes Made in monster-sized 40-kilogram wheels this washed-rind raw cow milk cheese is cooked, pressed and aged for nine to twenty-four months with extra care taken during the ripening process. Resulting is a smooth, rich-textured paste encased in an antique gold, amber-colored rind. Aromas range from butter to onion and ripe pineapple. A complex mix of sweet, salty and dominant nutty, meaty flavors finish with a tingle at the back of the palate that lingers thanks to raw milk. Suggested Pairing: Louis D’or grates & melts down perfectly in a fondue for two, adored alongside a robust, spicy red wine and your favourite someone. As the temperature falls, I prefer cozy evenings indoors, among crackling fires, big spicy red wines, and slow cooked comfort food. And to go with them, the perfect cooler weather curd: our famous, nationally celebrated, Bleu D’Élizabeth. Tasting Notes: This beautiful, semi-soft, raw organic cow milk blue cheese has a natural rind with spots the color of dark clay. 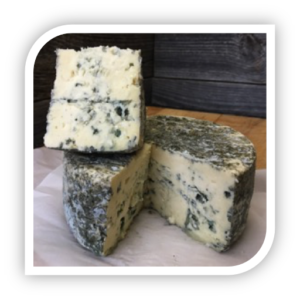 The creamy, silky, melt-in-your mouth paste (inside of the cheese) is speckled with blue and blue-green veins throughout from the presence of Penicillium Roqueforti (it’s the bacterial culture that makes a blue cheese turn blue). Bleu D’Élizabeth is rich in flavor, with a fermented quality to it lending hints of sweetness and spice, without being overbearingly salty. Suggested Pairing: Cold Canadian nights call for this hearty blue on your cheese board, either shining on its own, or playing a starring role as your dessert plate, joined by your favorite local Ontario ice wine, Quebec iced cider or Ontario port, like Van Alstine Red, Canada’s first ever port from Karlo Estates. Bleu D’Élizabeth is versatile enough to add a little sizzle to the last of the season BBQ steaks, to melt over savory desserts or baked potatoes, or to crumble in gratin vegetable dishes. Preheat oven to 400oF (200oC). In a skillet, melt butter over medium-high heat and sauté mushrooms. Deglaze the pan with wine and let liquid reduce until almost dry. Season with salt and pepper and add rosemary; let cool. Brush phyllo dough sheets with melted butter and fold each in half. Place a slice of Brie horizontally at one end of each phyllo dough rectangle. Top Brie with mushroom mixture. 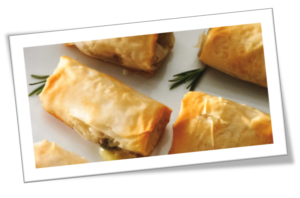 Fold in each side of the phyllo dough over the filling and roll up. 8. Repeat with the remaining phyllo dough sheets. Place on a parchment-lined baking sheet and brush tops with a bit of melted butter. Bake in the oven for 15 minutes or just until pastries are golden brown. Serve as an appetizer. Laliberté substituted into this recipe is heavenly! Preheat a homemade or store-bought piecrust at 350°F (180°C) for 10 to 12 minutes. In the meantime, mix 185 ml (¾ cup) of milk, 175 ml (¾ cup) of 35% cream, 3 eggs and 15 ml (1 tbsp.) of flat parsley in a bowl. Sprinkle with 150 g (5 ½ oz.) of Laliberté cheese cut into pieces. 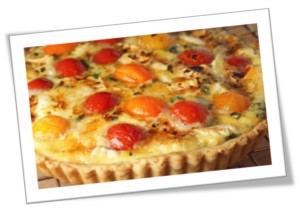 Pour the egg mix into the crust; add 5 or 6 cherry tomatoes of different colors. Bake the quiche for 30 to 35 minutes. Place 250g of room-temperature cheese in the blender with the eggs and additional egg yolk. Fold in the flour. Add half of the coriander, chives and parsley, and salt and pepper. Blend well. Roll out the dough on a floured surface and cut it into small sections. While the gnocchi are being prepared, cook the beet in a small saucepan with salted water until it can be cut easily with a knife. Let cool. Boil salted water in a saucepan and add the gnocchi. Boil until they float (about two minutes). Let them cool in a dish with 2 ml (1/2 tsp.) canola oil. Set aside. Finely slice the vegetables and sauté them in a skillet with canola oil. In another skillet, brown the gnocchi and add the seasoning mixture. Mince the garlic and coriander, and mix with the oil to form a paste. Season with salt and pepper and set aside. Mix the gnocchi with the vegetables. Add the walnuts and the remaining coriander, chives and parsley. Serve in a deep bowl with the remaining 30 g (1 oz.) of grated cheese. Preheat oven to 250°F. In a saucepan, pour the Port wine and 125 ml (1/2 cup) of the granulated sugar. Let simmer 15 to 20 minutes until the consistency becomes syrupy and forms a caramel. Add figs, coating them with the Port wine caramel, and continue cooking for 2 minutes. In another saucepan, heat the cream with the cheese until melted and completely mixed, without bringing to a boil (approximately 5 minutes). Strain to ensure the mixture is completely smooth, and set aside in a bowl. In a bowl, whisk the egg yolks with the remainder of the granulated sugar. Set aside. Using the whisk, gradually add the warm cream and cheese mixture to the egg yolk mixture. Place 8 ramekins in 125 ml (1/2-cup) in a shallow baking dish (or several). Pour enough boiling water in the dish to reach halfway up the sides of the ramekins, for an effect similar to that of a double boiler. Divide the fig and Port wine caramel mixture between the ramekins. Pour the cream and cheese mixture on top of the fig mixture. Bake for approximately 40 minutes or until the edges are set and the centers are still slightly soft. Remove the ramekins from the water dish and place them on a rack to cool. Cover and refrigerate for at least 2 hours or until cold. 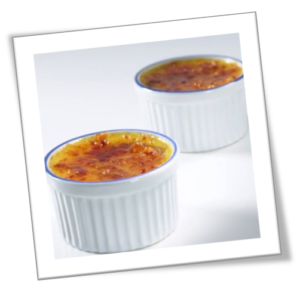 Sprinkle each crème brûlée with a thin layer of brown sugar. Broil in a preheated oven, as close as possible to the heat source, until the sugar melts and forms a golden crust. Serve immediately. Enjoy your Savvy Cool Curds!